Bicycles can be fun and practical to ride, however, parts from unused or unwanted bikes can be used to create art. Check out these 20 art pieces involving bicycles. Some of them are even quite practical! 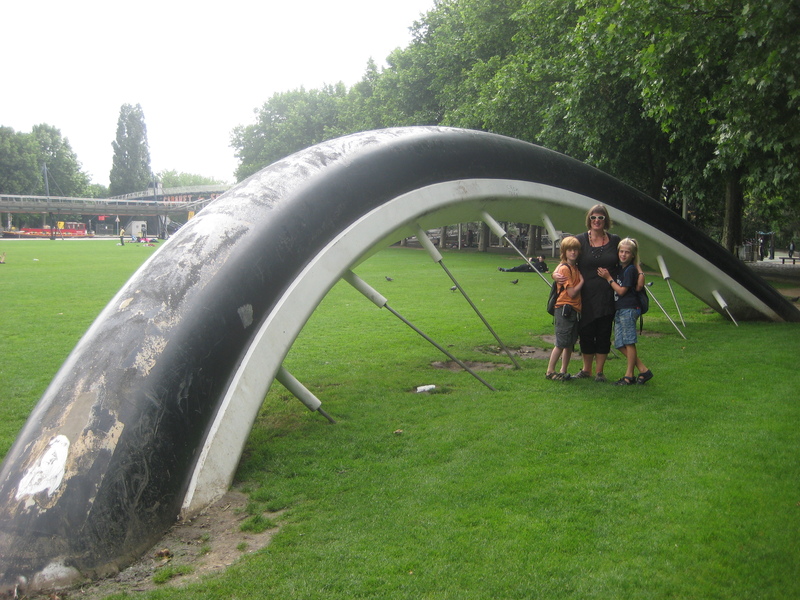 As seen on Inspiration Green, this geodesic dome-like structure is made out of bike wheels. At least one of the wheels appears to have no spokes so that humans can enter. Here’s a torus made from many bike wheels. For another take on geometric “wheel” sculptures, this lighting fixture appears to be made primarily from bicycle drivetrain components. For another take on bicycle gear lighting, here’s a trio using rear cassettes to hold an otherwise bare bulb. Or you could always build a “snowman” out of your unused gear train! On the other hand, this isn’t an entirely unique idea: Here is a white “picket” bike fence. When riding a bike you are generally sitting down. Making a stool out of bike parts seems only appropriate. This one adds a little cushion using a front suspension fork. On the other hand, if you have three identical fixed forks, this stool would be another good option. Here’s one made with the seat of an exercise bike and various other components. Finally, if you have friends to consider, the seat-bench shown above should keep everyone in place, if not totally comfortable! 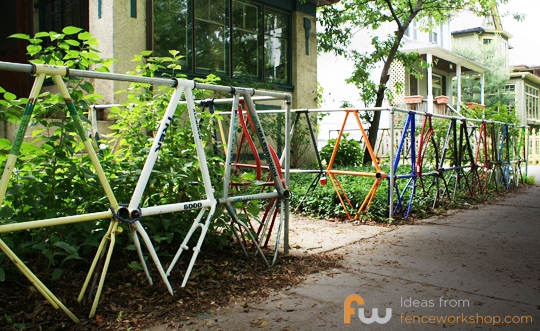 For a simpler take on bicycle wall art, here’s an idea involving a cluster of wheels attached to a wall. As seen on Bike Rumor, this mind-boggling sculpture uses 1200 bicycles for a visually epic effect! Although smaller in scale, this bicycle pyramid is another unique piece. Not to be confused with the “Giant” brand (and apparently not made out of actual bike parts) this bicycle sculpture appears to be sized for someone 20 feet tall or so! As seen on the Gleebitz blog, this buried wheel looks proportionally even bigger! As seen on itsnewstoyou, this bicycle sculpture by Alicja Kwade is called: Journey without arrival. Likely the title needs no explanation! Here’s another interesting idea: a rider on a bike shape, apparently made out of bike parts!